Indexing is one of the most important techniques to facilitate query processing over a multi-dimensional dataset. A commonly used strategy for such indexing is to keep the tree-structured index balanced. 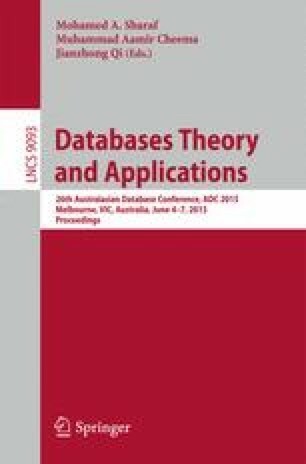 This strategy implies that all queries are uniformly issued, which is partially because the query distribution is not possibly known and will change over time in practice. A key issue we study in this work is whether it is the best to fully rely on a balanced tree-structured index in particular when datasets become larger and larger. This means that, when a dataset becomes very large, it becomes unreasonable to assume that all data in any subspace are equally important and are uniformly accessed by all queries at the index level. Given the existence of query skew, in this paper, we study how to handle such query skew at the index level without sacrifice of supporting any possible queries in a well-balanced tree index and without a high overhead. To tackle the issue, we propose index-view at the index level, where an index-view is a short-cut in a balanced tree-structured index to access objects in the subspace that are more frequently accessed, and propose a new index-view-centric framework for query processing using index-views in a bottom-up manner. We study index-views selection problem, and we confirm the effectiveness of our approach using large real and synthetic datasets.